Product #20725 | SKU SS-4320-KI | 0.0 (no ratings yet) Thanks for your rating! 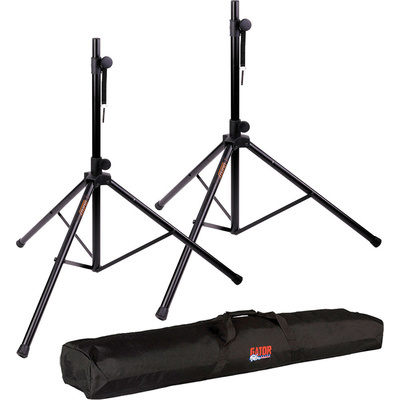 The Auray PA Speaker Stands and Bag Kit consists of two lightweight aluminium speaker stands that each support speakers up to 45.36kg, and a bag for transporting and storing the stands when not in use. The SS-4320 Lightweight Aluminium Speaker Stand from Auray is built to be lightweight, yet stable and durable; a single stand is capable of supporting speakers weighing up to 45.36 kg. It features a telescoping centre column with five height adjustments ranging from 120 - 198 cm. It also features collapsible legs for portability, as well as non-slip feet for traction on surfaces such as dance floors and stages.